Hamilton questioned Mercedes' team orders after the race: "I don't know why they just didn't let us race. It's quite clear their thought process." Lewis Hamilton rejected claims he used "dirty tricks" during the season-ending Abu Dhabi Grand Prix as he tried to win the Formula 1 world championship. Hamilton drove slowly in an attempt to allow rivals to pass Mercedes team-mate Nico Rosberg, but the German finished second to clinch his first title. Britain's Hamilton, who won the race, said: "I did nothing dangerous so I don't feel I did anything unfair. "We were fighting for the championship. I was leading. I control the pace." Hamilton was repeatedly ordered by his team to speed up. Mercedes insisted this was because there was a risk of him losing the race, not because Rosberg was not vulnerable to attack from first Red Bull's Max Verstappen, then Ferrari's Sebastian Vettel. But Hamilton told them to "let us race" and finally said: "I am losing the world championship so right now I don't really care whether I win or lose this race." He said after the race: "I don't know why they didn't just let us race. There was never a moment I felt I was going to lose the race but it is quite clear their thought process." As the sun sets on another F1 season, what does the future hold for Hamilton? Hamilton needed to win the race with Rosberg lower than third to clinch the championship. Vettel closed on to Rosberg's rear wing on the final lap but could not pass. He said over the radio to the Ferrari team: "It was a tricky situation at the end with Lewis playing dirty tricks." Champion: But does Rosberg deserve it? 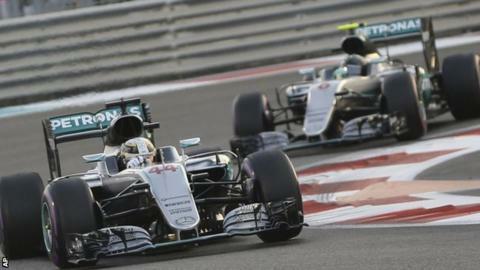 Rosberg said the race was "not enjoyable" but refused to criticise Hamilton, saying: "That's a pretty simple discussion. You can understand the team's perspective and you can understand Lewis' perspective. That's it." Mercedes team boss Toto Wolff said he had not decided whether to take some form of action against Hamilton for disobeying team orders. "I need to form an opinion, which I haven't yet," Wolff said. "Undermining a structure in public means you are putting yourself before the team. "Anarchy doesn't work in any company but the other half of me says that it was his only chance of winning the championship and maybe you cannot demand a racing driver who is arguably the best out there to comply with something where his instincts cannot make him comply. "It's about how to resolve that in the future because a precedent has been set." Wolff said the team had asked Hamilton to speed up because their computer models showed the race win was under threat from Vettel, who was on much fresher tyres and going more than a second faster, even if Hamilton increased his speed. Wolff will make the final decision on any possible punishment for Hamilton, but Mercedes non-executive chairman Niki Lauda told BBC Sport they will not be reigning in the three-time world champion. "There is nothing we can do," Lauda told BBC Sport. "This is his attitude and we accept it. It is important. That's it. "Lewis did his own race, he tried to win the championship in his way - but the danger was Vettel, we could have lost the whole race." Asked if Hamilton would be reprimanded by the team, Lauda replied: "No because we won the race and finished second, so we achieved the result. "There's nothing we want to do." Champion - but does Rosberg deserve it? Read more on Nico Rosberg is the 2016 Formula 1 world champion, but does he deserve it?